I’m going to use St Pattys Day to see if I can find a Miller MGD can. Looking for a St Patty’s version of MGD Light....the can missing in this photo. 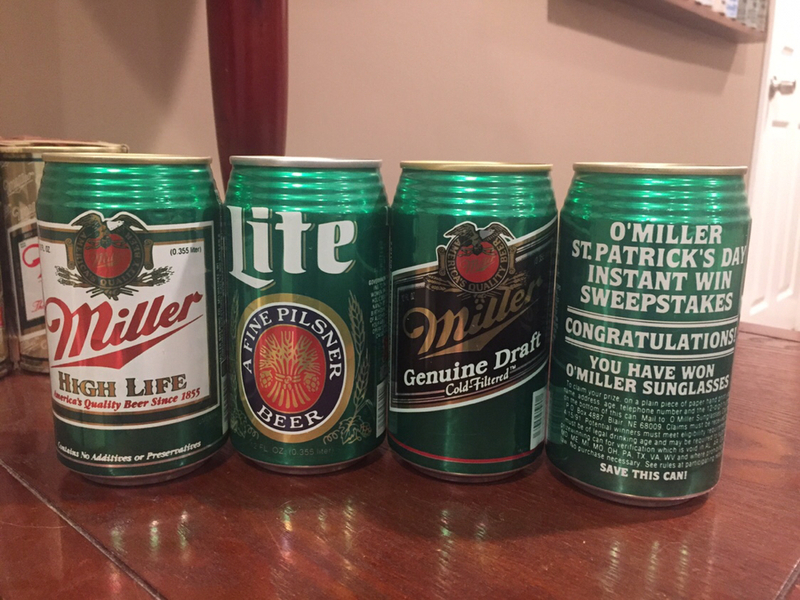 Did you see the guy at Toledo on the second floor had several different Miller green cans. I picked one up and he said he was selling as a set for somewhere over $100. (I don't remember if he had 3 or 4 different). Yep, I've talked to him on several occasions.....Steve....can't remember his last name. He does have the MGD Light but he won't break it up from the set. I would pay $40-ish for the MGD Light but the others are common $2-$5 cans (I think I offered him $50 at Cabin Fever a couple of years ago but he wouldn't take it). The Senator Seebs had one in his big Ryder truck buy at Canvention a couple of years back.....I saw it in a picture before he came to the show. Unfortunately, I couldn't find it or someone grabbed it before I got to the refrigerator box full of Millers. It's obvious that there's no time limit on GREED!